All India Congress Committee (AICC) president Rahul Gandhi has congratulated Assam’s witch-hunting crusader Birubala Rabha who has been recognized by the Women’s World Summit Foundation. It may be mentioned that the Women’s World Summit Foundation recognized Birubala Rabha for her contribution to fighting against superstition of witch-hunting. “I salute you and the progressive beliefs you stand for. I hope that many more young women are inspired by you and work towards building a more humane society,” added Rahul Gandhi. 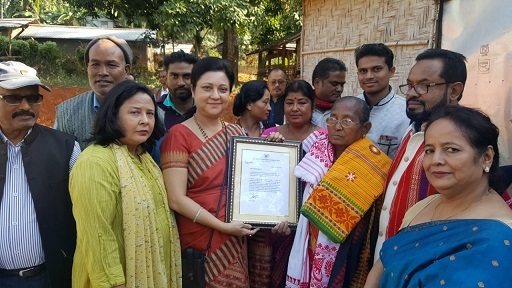 The letter of appreciation from Congress president Rahul Gandhi was delivered to social activist Birubala Rabha at her Agia residence in Goalpara district on Monday by a team of Assam Pradesh Congress Committee (APCC). On behalf of the Assam PCC, the letter of appreciation was delivered by APCC general secretary and senior spokesperson Bobbeeta Sharma and Goalpara West MLA Abdur Rashid Mondol along with a host of office-bearers of Goalpara District Congress Committee. Birubala Rabha was awarded the Women’s World Summit Foundation (WWSF) prize for women’s creativity in rural life for the year 2018 on October 2, 20187. Sixty-nine-year-old Birubala Rabha is known for her continued battle against the evil practice of witch-hunting. She has already received a number of awards in recognition to her fight against witch-hunting.